Produced by the quality English makers, Aynsley. 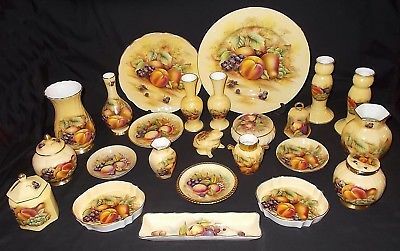 This stunning pattern features a beautiful still life of ripe and full fruit rendered in appealing warm, Autumnal tones. An arrangement of harvest fruit is bursting to life, set amongst the green foliage which perfectly balances the design. The fruit still life appears on a warm golden yellow background, the whole scene is filled with the beautiful warmth of the sun. A glistening gold trim to the rim perfectly frames the pattern. 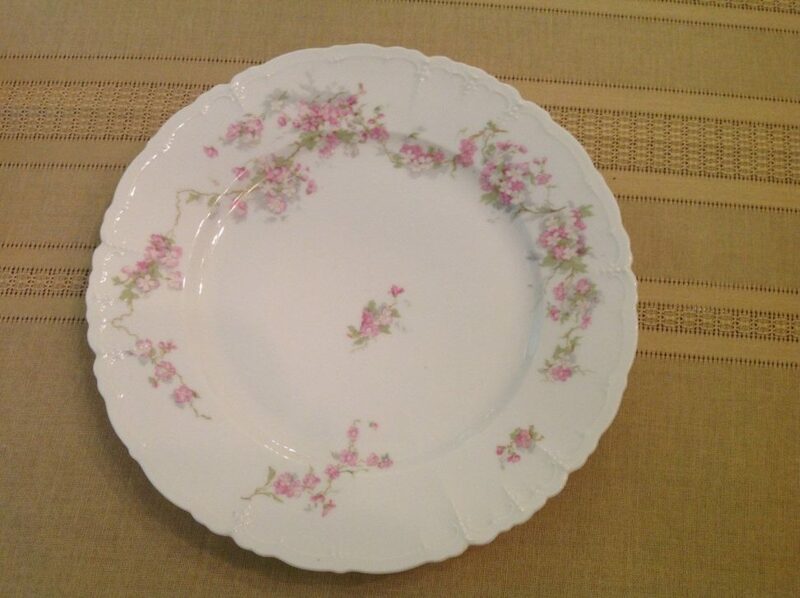 This beautiful antique porcelain plate features an elegant scalloped and embossed rim and is decorated with beautiful light pink roses and white flowers with light green foliage on a white background. The MZ Austria mark with the Austrian imperial double-headed eagle, dates this piece between 1884 and 1909. The Moritz Zdekauer Bank of Prague bought this porcelain factory at Altrohlau in 1884 and exported to North and South America, to the Dutch market and to Dutch colonies. Pieces were decorated with lavish floral patterns and overglaze gold decoration. 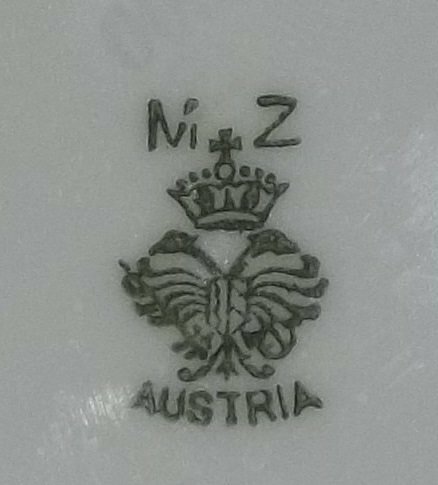 MZ Austria mark used by Moritz Zdekauer on porcelain produced at Austrian factory based in Altrohlau from 1884 to 1909. The firm was bought by C.M. Hutschenreuther in 1909 and then used a MZ Altrolau mark. The firm operated under the name Altrohlau Porcelain Factories from 1909 to 1945. It was nationalized after World War II. In 1992, the factory as privatized and was an established stock company known as Starorolsky Porcelan Moritz Zdekauer. Since June 2013 the porcelain tradition has been continued by the limited liability company Bohemia porcelán Moritz Zdekauer 1810, who purchased the assets and the trademarks from the wound up joint-stock company Starorolský porcelán Moritz Zdekauer without any production interruption. The factory in Stará Role (Altrohlau) near Karlovy Vary was founded 1810 by Benedict Haßlacher who purchased land on the left bank of the Rolava river to build a mass mill, two buildings and one round furnace and to establish a pottery manufacture there. Bought by Augustin Novotny in 1824, under his management employment rose to 100 workers. In 1836 Novotny started manufacturing porcelain. The factory production was constantly rising. In 1870 it employed 800 workers. Inspired by the melting ice in Northern Finland, Tapio Wirkkala created Ultima Thule in a deeply remote cottage in Lapland in the 1960s. The mid-sized Ultima Thule glass serving bowl with its distinctive and intricate bottom that imitates the ebb and flow of melting ice can be used to serve, for example, nuts, chocolates and sweets. 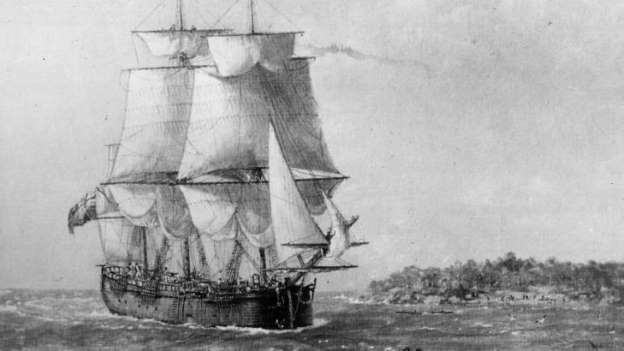 Marine archaeologists believe they have finally identified the resting place of HMB Endeavour, the ship James Cook commanded to Australia on his first voyage of discovery, an achievement that would solve one of the greatest maritime mysteries of all time. Source: Where is the Endeavour in Newport Harbor? At 5-6 p.m. on Friday, September 21, at the Gurneys Resort on Goat Island, Newport, Rhode Island, archaeologists from the Rhode Island Marine Archaeology Project (RIMAP) and its partner, the Australian National Maritime Museum (ANMM), will announce their 2018 research results for the study of the Newport Harbor transport fleet. The event will review how the 25-year-long archaeological study of the Newport transports has narrowed the search for the Endeavour from a fleet of thirteen vessels to five, and now possibly to one or two archaeological sites. A 19th century Victorian cut glass decanter. 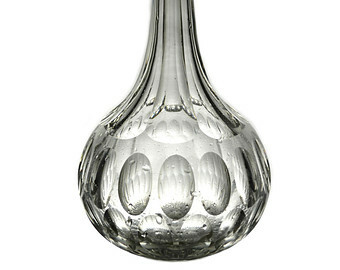 The body and neck of the decanter have faceted sides. 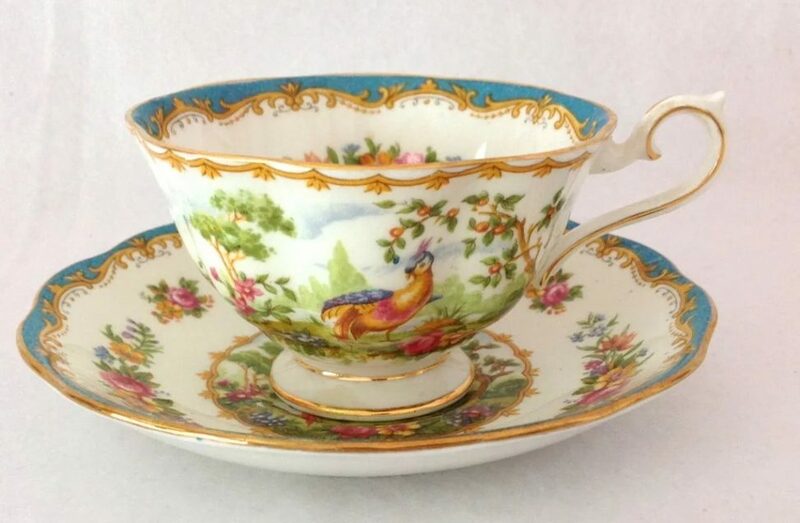 Royal Albert Chelsea Bird pattern was made in England between 1940 and 1980. It is a rare and valuable collectible. In 1896, Thomas Clark Wild bought a pottery in Longton, Stoke on Trent, England, called Albert Works, which had been named the year before in honor of the birth of Prince Albert, who became King George VI in 1936. 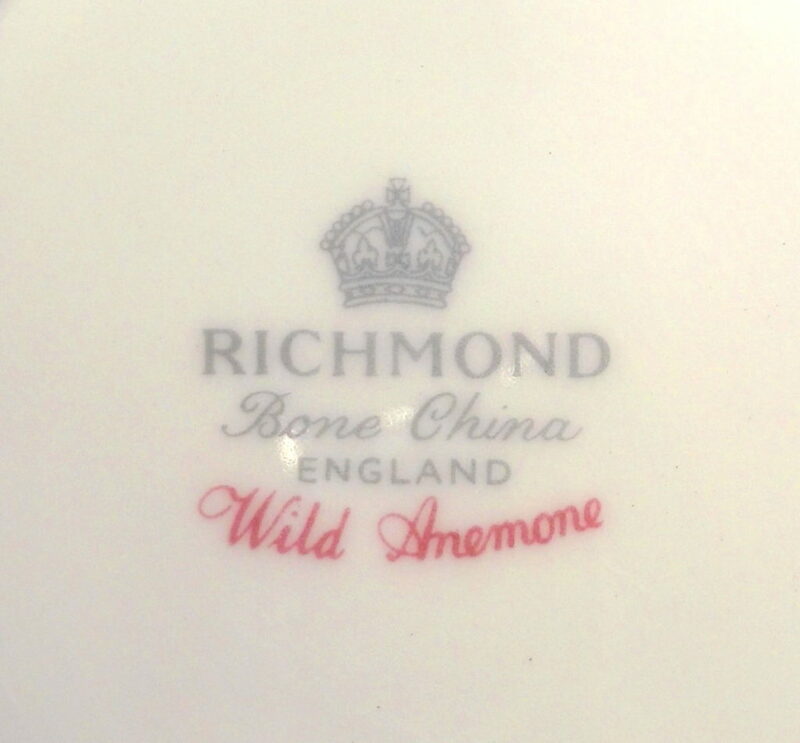 Using the brand name Albert Crown China, Thomas Wild and Co. produced commemorative bone-china pieces for Queen Victoria’s 1897 Diamond Jubilee, and by 1904 had earned a Royal Warrant. From the beginning, Royal Albert’s bone china dinnerware was popular, especially its original floral patterns made in rich shades of red, green, and blue. Known for incredibly fine, white, and pure bone china, Royal Albert was given to the sentimental and florid excesses of Victorian Era England, making pattern after pattern inspired by English gardens and woodlands. 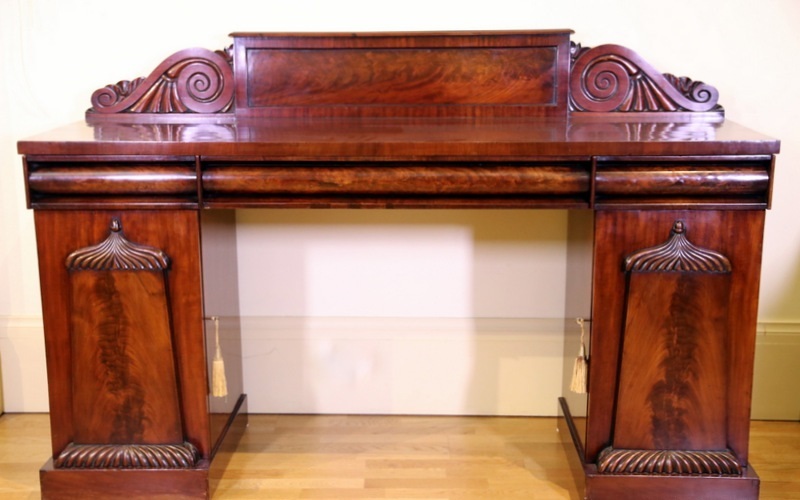 With beautiful designs, the patterns appealed to a wide range of tastes, from the simplest to the most aristocratic. 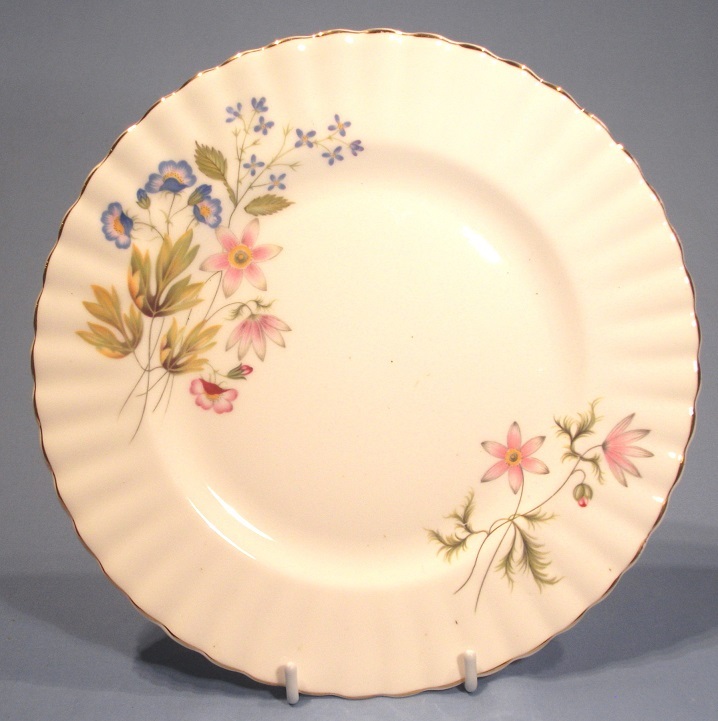 Richmond Wild Anemone Vintage Bone decorated with delicate wild anemone flowers and leaves. 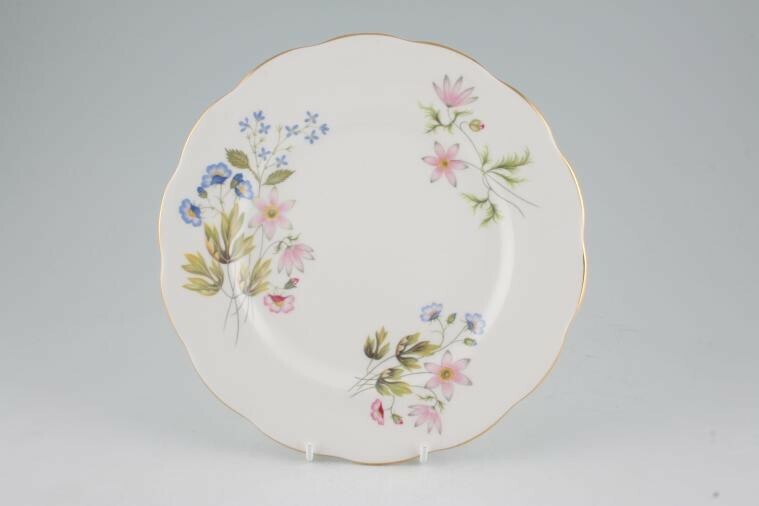 Richmond Wild Anemone vintage Bone China tea plate with fluted border. Plate diameter 20.5 cm. In 1972, the Pearson Group acquired Royal Doulton, and merged it with Allied English Potteries and the Richmond China patterns were absorbed under the Royal Albert name or were discontinued. 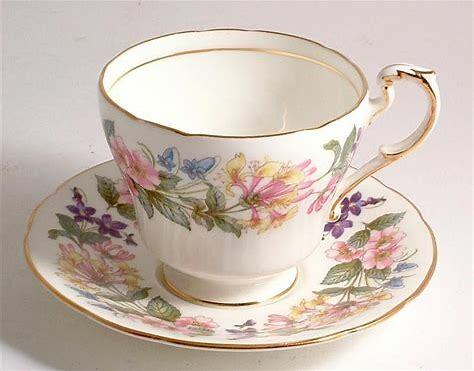 This scalloped and gilt footed cup with a floral pattern of bluebells honeysuckle and roses was made between 1972 and 1990. Paragon became part of Royal Doulton in 1972 and continued to produce china under that name until 1991. 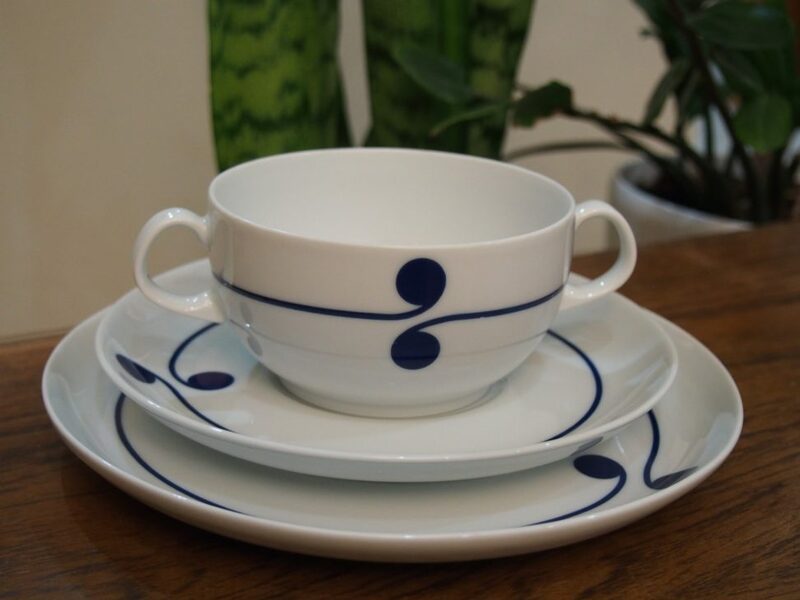 By 1989 the name and patterns had been absorbed into Royal Albert and by 1992 the Paragon name was discontinued. A deep square edge top with a low flat topped gallery flanked by volutes, three frieze drawers of ogee profile and raised on twin pedestal cupboards with fine gadroon tent top panels to the doors, shelving to the interior and raised on a plinth base.